Colour-coded utensils are a vitally important facet of any commercial kitchen or business, and a very handy addition to any home-cooking set-up, widely available through any good supplier. This article lists a few central reasons as to why they are so important, ranging from differentiation, to the prevention of cross-contamination, protection of the equipment itself, ease of identification and general efficiency. It’s important for the quality of food that these chopping boards are only used for their intended food stuff. If, for example, you only had one chopping board, used it to cut raw fish and then, without washing it, used it to cut salad, you might end up with oil all over the salad, spoiling the taste. However, taste could be the least of your worries if, for example, you chopped raw chicken on the board and then used it for chopping salad: in which case it’s possible that dangerous substances (such as juices containing salmonella) could spread to the salad which, if then consumed, could lead to serious illness or even death. Such could be the case even if you were to wash the board after chopping the chicken: residual juices could remain and contaminate food later chopped on the board. The solution, then, is to use colour coded chopping boards, which helps workers keep track of which board has been used for which food stuff: a green board won’t have been used for chicken, if good practice has been maintained, and should therefore be safe to use for chopping salad at any time. 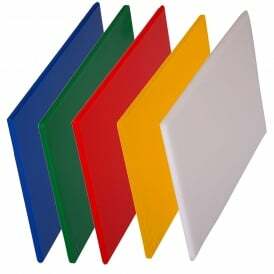 In short, then, colour-coded chopping boards help to prevent cross-contamination; a concern not just in commercial kitchens, but also at home. This isn’t just true for chopping boards, however: it’s also good practice to colour-code other kitchen utensils which come into contact with food, or at least ensure that you only use certain ones with certain foods. For example, using two different chopping boards for raw chicken and salad will do little to prevent dangerous juices spreading to the salad if you use the same knife for both jobs. Finally, food-related utensils are not the only pieces of equipment which need to be colour coded. 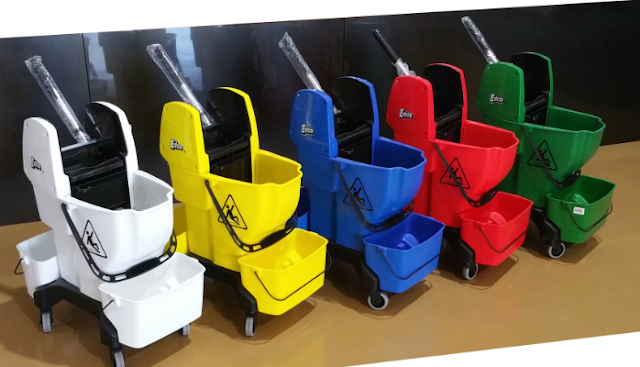 Cloths, mops and buckets which are used to clean in different areas (such as toilets, bars, glass, kitchens, etc.) need to be differentiable in some way in order to prevent cross-contamination. Colour coding is one of the best ways of achieving this. Another good reason to colour-code equipment is to protect the equipment itself. Sometimes pieces of equipment are shaped the same, yet are made of different things. Using a piece of equipment which is made of a certain material in a job for which it is not intended can damage it. For example, standard paddles and heat-resistant paddles can often look the same – but one can withstand higher temperatures when using them to cook. This is where colour coding comes in handy again, helping you differentiate between the two different types. When you have a potentially dangerous occurrence, such as a spill or glass breakage, you need to deal with it fast. Having a highly visible piece of incident equipment is therefore imperative. If all your equipment is the same colour, valuable time can be wasted identifying which is the appropriate one. However, were you to have a bright red glass breakage incident kit handy, or a bright yellow handle on your broom, it would be much easier to spot. Finally, a lesser-known but nonetheless important reason to colour-code your equipment is the fact that it increases the overall efficiency of a kitchen or workplace. By sub-dividing your equipment along any lines (here, it’s colour), it’s easier to keep track of numbers. For example, with three sets of six colour-coded chopping boards, it’s easy to keep track of how many chopping boards you have ready to use on raw fish: if there are two blue boards sitting next to the sink and a big order for fish coming in, it’s probably a good idea to prioritise washing-up the boards. As a general rule, then, colour-coding helps you keep track of how many pieces of equipment are in use, and how many need to be washed at any one time during potentially very busy stints at work. What’s more, having colour-coded labels is a good way to decrease the amount of labour necessary to complete a particular task. If workers know exactly where foods need to be processed, when certain foods need to be used by, and where to store foods, all from glancing at the label, then you have an efficient workplace. Overall, then, the colour-coding of equipment is important for a number of reasons. Generally speaking, the main concern is safety, especially in terms of the avoidance of cross-contamination. However, the ease of differentiation does carry other perks, not least of which is an increased level of overall efficiency derived from an investment in colour coding; ultimately making such equipment a sound investment for any commercial venture or home environment.